Six men will qualify to the 2020 Olympic Games by winning the overall title of the FIG’s Apparatus World Cup two-year series, which began with Cottbus in 2018 and ends with Doha in 2020. 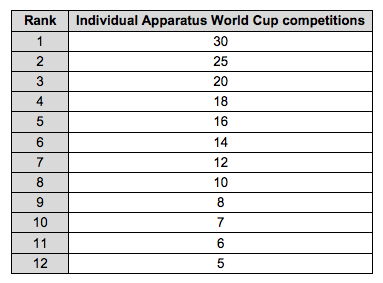 Each gymnast who places in the top 12 at an apparatus world cup receives points that coincide with his ranking. At the conclusion of the eight apparatus world cups, the gymnast with the highest three-meet point total on each apparatus will be declared the apparatus series winner to earn the bid to Tokyo.